The new Mazda 3 is more stylish and fuel-efficient than the outgoing car of the same name. It uses ‘Skyactiv’ technology – Mazda’s term for a host of fuel-saving measures – to deliver impressive economy and emissions. Practical Caravan's tow car experts tested the least powerful petrol version (the diesel was among the vehicles that were judged in the Tow Car Awards) in top-of-the-range Sport Nav spec. It’s cheaper than the equivalent diesel and surprisingly fuel-efficient. The question is, does the 118bhp 2.0-litre petrol engine have enough poke for towing? The reviewers accepted in advance of testing that this least-powerful petrol model in the range wouldn’t tow a caravan as well as a diesel, but they were looking for enough muscle to keep up with the ebb and flow of traffic. If you are considering what tow car to buy next, should this petrol powered Mazda be on your shortlist? If they take a belts-and-braces approach to outfit matching, owners of 2.0-litre petrol powered Mazda 3s will need to choose their caravan carefully. With a kerbweight of 1355kg, the 3 has an 85% match figure (as usually recommended for secure and stable towing) of 1152kg. For more experienced drivers happy to tow heavier caravans, the legal towing limit is 1300kg. Our experts matched the Mazda to a Swift Expression 514 with a Mass in Running Order of 1256kg. It’s worth noting that this caravan wouldn’t make a legal match for the Mazda if fully loaded. Most of Practical Caravan's team tow with diesel cars, so our reviewers needed to change their driving style to tow with a petrol. Whereas a diesel pulls strongly in the middle of the rev range, petrols generally need to be revved higher for good performance. That means more frequent gear changes and a heavy right foot. Just a mile or so after collecting the Swift from Michael Jordan Caravans, our testers towed up a long hill that they typically tackle in fourth gear driving a diesel. In the petrol Mazda, they soon changed down to third, and were in second gear by the top in order to hold speed. That’s not surprising when you consider that the 2.0-litre has a modest 155lb ft of torque, available at 4000rpm. To be fair to the Mazda, the testers were pulling a heavier caravan than most owners would match to a car of this weight and performance. At the test track, the Mazda 3 showed that it’s up to the job of towing so long as the driver is prepared to work the gearbox. The Mazda pulled from 30 to 60mph in 14.4 seconds, a much quicker time than they’d expected, given the sluggish response while driving uphill. The engine is less flexible at low revs, though. Our reviewers usually record a 50-60mph acceleration figure in fifth gear, but the Mazda ran out of straight before it reached 60mph. In fourth gear it took 17.9 seconds. Otherwise the 3 proved itself to be a good tow car. Once up to speed, it remained stable and steady at the motorway limit, despite pulling a 93% match. Through the lane-change test, the 3 was unperturbed by having such a big van behind it, changing direction quickly, steering with precision and gripping well. In the hill-start test, the handbrake held the outfit still on the 1-in-10 slope so long as it was pulled on firmly. Plenty of revs and a careful balance of clutch and throttle were needed to reach the top of the slope. After trying the same gradient in reverse there was a slight burning smell from the clutch. Our experts had no issue with the car’s brakes in regular towing, and on the test track they stopped car and caravan from 30mph in 11m. That’s a respectable stopping distance, with quite a big van to bring to a halt. It’s rare that Practical Caravan tests a petrol car, and towing with the 3 reminded our team why they prefer diesels. However, the Mazda made a decent fist of towing once the driver changed gear more frequently, with impressive stability at speed. Without a caravan, the Mazda 3 2.0-litre petrol engine’s limited torque is less of an issue, according to Practical Caravan's tow car reviewers. However, the Seat Leon and other rivals use a low-capacity turbocharged petrol engine, which performs better in the mid-rev range. Instead, what stands out is the engine’s refinement. It’s a quiet engine, even when pushed, and the slick-shifting gearbox makes it a pleasure to use. There’s a pleasing precision to all the controls in this car. The chunky steering wheel feels just right in your hands, and it feels poised and balanced – the Mazda is good fun on country roads. The ride is rather firm, but we could live with it. Besides, if our experts were spending their own money, they’d be tempted to choose the cheaper SE model with smaller alloy wheels. From experience driving this version and the Sport Nav back-to-back, the 3 rides better with smaller alloys. In that respect the Mazda 3 improves on its big brother, the 6 family car. But just as the Mazda 6 is noisier at speed than the Volkswagen Passat, the 3 produces more road and wind noise than you’d hear in the cabin of a Volkswagen Golf. Around town, the 3 is easy to drive smoothly, thanks to a light clutch action and progressive brakes. However, better over-shoulder visibility would help when parking. All told, the Mazda 3 is a very enjoyable car in everyday driving. The Mazda 3 is far from the biggest small hatchback, but it’s competitive on space with the majority of its rivals, the Practical Caravan review team discovered. Up front, there’s sufficient adjustment to the wheel and seat to keep drivers of most shapes and sizes happy. In recent years, Mazda has worked on the quality of the finish in its cabins. The 3 has a more upmarket feel than Mazda has achieved in the past and a sporty design that suits the character of the car well. In the back, head and legroom are average by class standards, and the upwards slope of the window line and thick rear pillar can make passengers feel a bit hemmed in. There’s also a pronounced hump to the middle of the floor which makes the Mazda 3 better suited to carrying two in the back rather than three. What’s more, there are no air vents in the door pillar or between the front seats to help keep rear-seat passengers cool. Boot space compares well to most rivals, with 364 litres when the rear seats are upright. There’s a definite lip over which you must load items, and with the seats folded flat there’s a slight slope to the floor. For couples who are unconcerned with rear-seat space, but who want a large boot for holiday bags, the Peugeot 308 has more room. For family drivers who want plenty of space for passengers and luggage, the Skoda Octavia better fits the bill. However, if space and practicality don’t top your list of priorities, you'll find that the Mazda 3 is on a par with most small hatchbacks. Even though it’s the bells-and-whistles specification, the Mazda 3 2.0 120PS Sport Nav still costs under £20,000. Research by Practical Caravan's sister magazine, What Car?, suggests that haggling will save £300-£400. That’s not a huge discount, but then the Mazda 3 had only recently gone on sale at that stage. 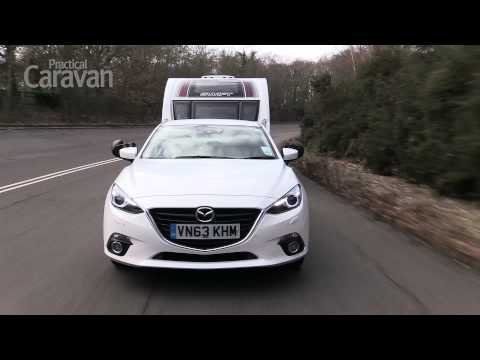 You get plenty of equipment for your money, as the Practical Caravan Mazda 3 review showed. The Sport Nav spec has 18in alloys, sat-nav, a head-up display, a nine-speaker stereo and climate control. Even the entry-level SE model isn’t short of kit, and brings the price down to £16,995. All the safety equipment you’d expect is fitted, and the 3 has achieved a five-star rating from safety experts Euro NCAP. For a petrol car, the 3 promises exceptional fuel economy. According to official tests, it returns 55.4mpg on the combined cycle. Only a few years ago that would have been an impressive figure for a diesel. Emissions of 119g/km put the car in Band C for Vehicle Excise Duty. Given how hard Practical Caravan's experts had to work the engine, they didn’t have high hopes for decent economy when towing, so achieving 24mpg was a pleasant surprise. The car comes with a three-year, 60,000-mile warranty. Touch wood, given Mazda’s reputation for reliability you shouldn’t need to use it. According to What Car?’s experts, expect the 3 to be worth 41% of what you originally paid for it after three years. All things considered, the Mazda 3 is good value and a sensible buy. Practical Caravan's reviewers made life hard for the Mazda 3 by matching it to a relatively heavy caravan. It coped – just about – but towing with a petrol car did underline how much diesel engines are better-suited to towing. However, if you only tow from time to time or have a very light caravan, then the lower purchase price of a petrol is a strong argument in its favour: the 2.0 120PS Sport Nav is over £2000 cheaper than the equivalent diesel. It may have taken a heavy right boot to persuade the 3 up to 60mph, but once there the Mazda felt stable and secure. It also took the caravan by the scruff of the neck in the lane-change test. Our experts would be surprised if the heavier diesel model wasn’t better still. Practical Caravan's testers really warmed to the Mazda 3 as an everyday car. Precise steering and well-judged suspension make this one of the most entertaining small hatchbacks to drive, and although the ride is firm, it’s not harsh. The slick-shifting gearbox and refined engine are also plus points, although less wind and road noise would make the 3 a more refined motorway car. It’s not the roomiest small hatchback, but it’s competitive with the Ford Focus, Seat Leon and Volkswagen Golf. If you need a lot of room for people and bags, though, a Skoda Octavia is a more practical choice. Our team doubts that many buyers will have those two tow cars on the same shortlist, though. The Mazda 3 is a sportier car to look at and to drive than the Octavia. It’s distinctive, different and very capable.